Wii Fit really is a remarkable achievement in video games. The Wii console has wowed the world with its Wii mote controller that reacts to your every move. 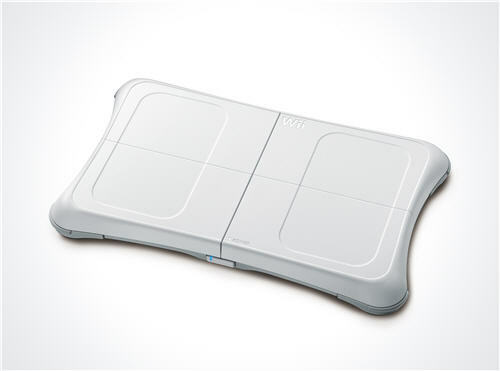 Now the Wii balance board is a fitness mat that monitors your every exercise and takes the interactive coolness of the Wii to the next level. Wii Fit is an exercise system for the Nintendo Wii console. The game comes with a Wii balance board and a game disc that contains over 40 different exercises. Start with a fitness test and let the game create a Wii fitness program that'll get you into shape! When you turn on the game, you're greeted with an assessment page – this is just like starting at the gym! You'll start with a weigh-in on the exercise board (it's an exercise board and scale in one). 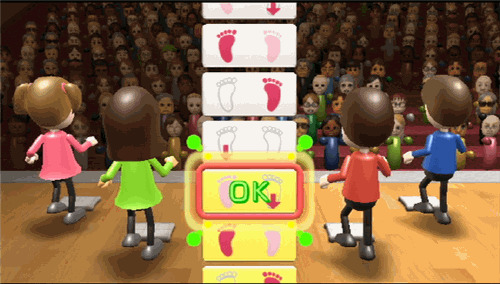 The game records your weight and health profile, and calculates your Wii Fitness using a unique scoring system between 2 and 99. Based on your Wii Fitness score, the game creates an exercise program around your own personal goals. Yoga: includes 15 yoga poses with increasing levels of difficulty from deep breathing exercises to one-leg stretching exercises. Strength Training: includes 15 muscle strengthening workouts for most parts of the body, including push-ups, lunges, sit-ups, and leg and arm lifts. Aerobics: includes 9 fat burning exercises like jogging, step aerobics and rhythm boxing. Balance Games: includes 9 fun balance activities based around sports themes. There's snowboarding, skiing, tight rope walking, soccer heading among others. Most of the exercises in the game start off being "locked", and you'll unlock them to use as you progress through your exercise programs. This is how the game forces you to start slowly and build up your Wii fitness. As your exercise program gets easier, Wii Fit adjusts your program just like any nasty personal trainer would. A complaint about the game though, is that you can't create your own exercise programs or change the program you've been given. This is a bit of a drawback, especially for people who like to do something different every time they exercise. The Wii balance board is your personal exercise mat. The board has highly sensitive sensors that send feedback to the game on how well you're doing your exercises. Do your exercises well and the game will praise you, but try to cut some corners and the game will give you a bit of a tongue lashing! The Wii balance board is built tough and can handle body weight up to 150kg (330 lbs). Although only two people can alternate exercises during an exercise session, any number of people can have profiles on one Wii console. Each person simply stores their profile on the Wii channel and loads it when they want to train. The game uses a tracking system to help you monitor your progress. This is in the form of graphs tracking your Body Mass Index (which is a measure of your height and weight), your Wii fitness and your health profile. Over and above the exercises you do in the game, you can also enter outside activities you've done during the day. These could be low-level activities like housework or rigorous activities like football or basketball. The game includes these outside activities when calculating your exercise progress. If you're the competitive type, you can compare yourself to other players. If you're a little more shy, the game lets you password-protect your progress charts so that nobody else can see how you're doing. Wii Fit is a great exercise game for people looking to start an exercise program. This game is no substitute for a professionally designed training program though, and is more about "fun exercise" than it is "serious exercise". The game also attempts to provide health/medical advice based on your health profile, but this is very rough at best. The game is a little more pricey than most other Wii games because is comes with the electronic balance board. I would recommend it to people wanting to do moderate exercise in a way that is really fun, unique and interactive. There are already a few other Wii fitness games in production, that I'm almost sure will use the Wii balance board too, so you'll get to use the board again in the future. If you're looking to get into serious shape, or you're looking to follow a serious training program, then this particular Wii fitness game isn't the right tool for you. A lot of the exercises in the game would be considered gimmicky by serious exercisers, because they put an equal emphasis on fun and interaction as they do on actual exercising. This game has been unbelievably popular around the world, and can be very difficult to find in stock. This is especially true in the US which has suffered serious stock shortages. If you're looking to buy one then check out below to see if I have it in stock. If I don't have any left in stock and you can find it at another reputable online or offline retailer, I would advise you to go ahead and buy it. You might not get another shot for a while. If you’re looking for that perfect game and you’re not interested in the Wii Fit, the Wii Games page will point you in all sorts of interesting directions.